What a delightful story this is! And so well done too, on every level—direction, writing, acting, cinematography. 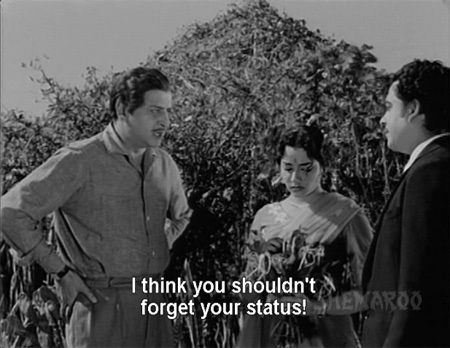 It’s a tightly plotted comedy, romance, mystery and lost-and-found tale all in one, starring Kishore Kumar and Pran, and a heroine who sticks up for herself (in 1963!). Even Lalita Pawar (how I love her) is smiley and beautiful in it, and the songs by Chitragupta are lovely, too. All in all it’s a treat for anyone who appreciates good solid entertainment—a total winner! Kishore Kumar Verma (Kishore Kumar) is an orphan who has managed to complete his bachelor’s degree. He is called to Ooty by his friend Champak (Agha) who has recommended him for a job with a local bigwig, Seth Khunalchand Peshawari (what a mouthful!). 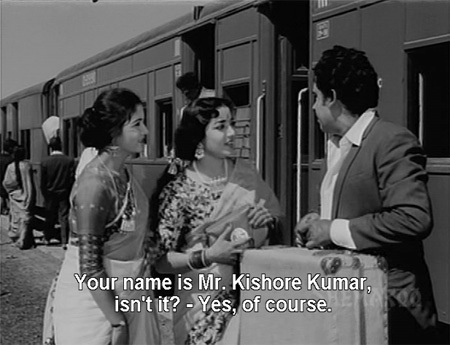 Upon arrival at the train station, though, he is met by Khunalchand’s daughter Sushma and niece Beena (Jamuna) who mistake him for a singer they have hired by the name of Kishore Kumar Sharma. They take him home with them, and he is quickly head over heels for Beena—and she for him. To further their romance, he doesn’t tell them about the mistake in identity when he figures it out either, but goes ahead and performs at the music show with Beena. It’s a very fun song with nice dancing by Jamuna. I particularly love the set, with a giant Saraswati and oodles of traditional ghee lamps! Unfortunately, the real Kishore Kumar Sharma shows up at the end of the performance and denouces our Kishore Verma as a fraud. He manages to escape, and with Champak’s help disguises himself and gets the job he was originally supposed to be there for—working for Khunalchand—so that he can stay near Beena. 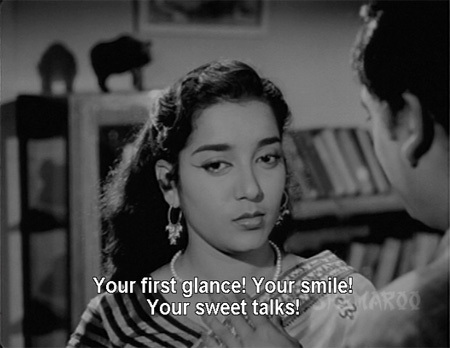 At the same time a guy named Arun (Pran) arrives to visit Beena; she is clearly less than happy to see him, but he persists in his attentions to her. Kishore steps in to help her out. But he runs into trouble when he takes off his fake beard and mustache so that Beena will recognize him. Khunalchand sees him too, and sets the police after both him and Champak. They board a train, but having no money can’t buy tickets. Poor Champak is caught and arrested by the railway guards, but Kishore manages to escape again and lands up in a compartment with a sole (sleeping) occupant. No sooner has he hidden himself there when another man comes in with a knife and prepares to stab the sleeping passenger. Kishore stops the assailant, who manages to get away. The passenger is a very nice and wealthy man by the name of Girdharilal (Niranjan Sharma). When Kishore tells him he needs a job, he takes him home with him. 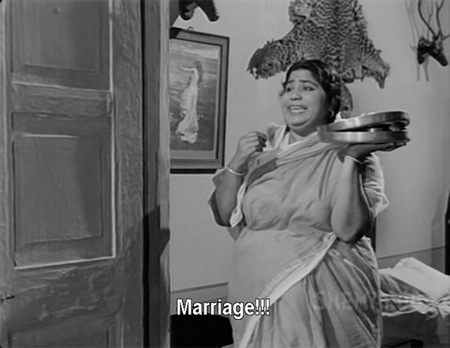 Girdharilal introduces him to his wife Kamla (Lalita Pawar) and sets him up with a job in his factory. 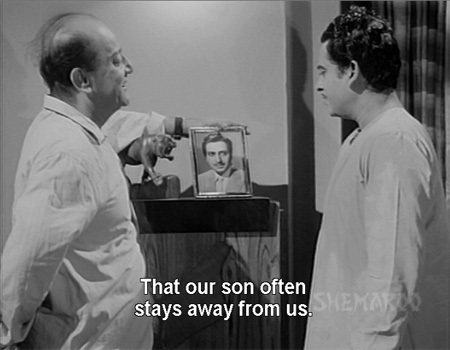 Kamla and Kishore feel a strange instant connection to one another, and Girdharilal tells Kishore soon afterwards that they had lost their son Arun when he was a little boy and have only recently found him again. Meanwhile poor Champak has been sentenced to fifteen days in jail for traveling without a ticket—and an old magician has befriended him. 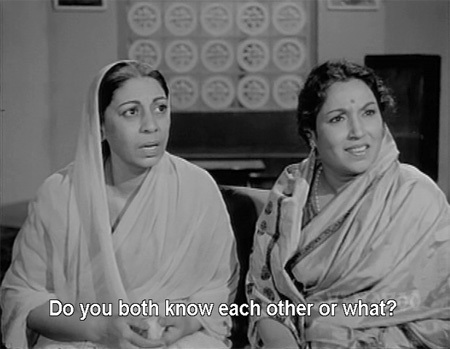 Meanwhile, Beena is now visiting her mother (Mumtaz Begum), who is Girdharilal’s old friend and neighbor, and they come to pay their respects. She is naturally startled to see Kishore there, and not very surreptitiously calls him a fraud and other bad things. She doesn’t give him away though, and he manages to convince her that he really does care for her and that all the deception he had perpetrated before was only in pursuit of her. They are soon spending large amounts of time together singing some very lovely songs. We now find out that Arun is the one who hired someone to kill his father—someone who looks exactly like Champak, although his name is Shankar! Arun is not pleased by Shankar’s failure to bump off Girdharilal. Arun is also in cahoots with Girdharilal’s factory manager, Chunilal (Madan Puri). Girdharilal has begun to harbor some suspicions about Chunilal’s honesty, especially once Kishore begins working there and discovers discrepancies in the account keeping. Chunilal also engineered Arun’s “reunion” with his parents—and it’s a big fraud. As criminals do, he and Arun quarrel frequently over who gets what share of their booty; Arun, being set up now as the heir apparent, engenders some envy on the part of Chunilal. At the same time, Kishore is unwittingly engendering fury on the part of Arun, who is also scheming to marry Beena for her inheritance. Beena tells Arun off after this, saying that she cares for humanity while he only cares for money, and they have nothing in common—which, she adds sensibly, would only make them miserable together. Arun scurries off immediately to meet Girdharilal and encourage him to announce their engagement at Beena’s upcoming birthday party. Unknown to Beena (because nobody has told her, as if it’s none of her business) Girdharilal and her late father had agreed when she was a child that if Arun was ever found she would be married off to him. At the party, she is horrified and Kishore is crushed when the announcement is made. She begs Kishore to say something to Girdharilal on their behalf, but he refuses to do so because of all Girdharilal and Kamla have done for him. In fact, he hasn’t even told them that he knows Arun is stealing money from the factory in league with Chunilal. 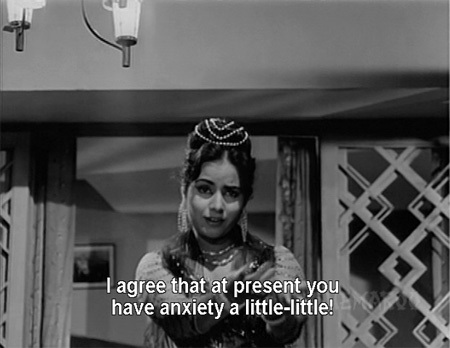 He’s afraid that it will be the death of Kamla, who dotes on her long-lost son (and on Kishore himself, too). 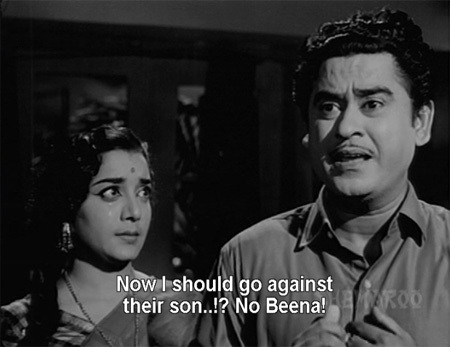 Beena takes matters into her own hands—you go girl!—and goes to see Girdharilal. Girdharilal seems unsurprised at her dislike of Arun, and very understanding; Beena asks him to think about the engagement, and tells him that if he decides she should marry Arun she won’t go against him. 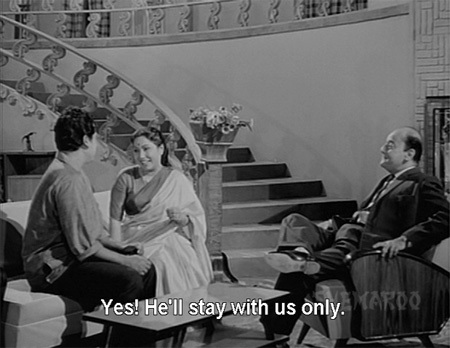 A housemaid takes the tale of this conversation to Arun, who has had enough of both Chunilal—who no longer trusts him—and Kishore. He summons Kishore and tells him to go and finalize a business deal that evening, giving him Leela’s address. 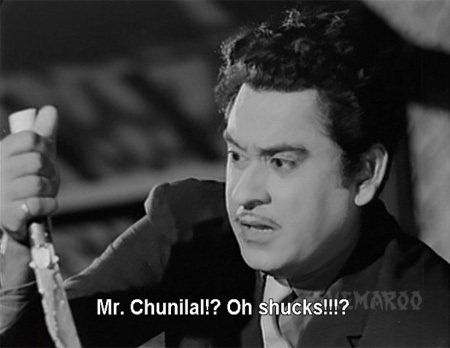 When Kishore arrives, he is surprised to see Champak-lookalike Shankar, but comes inside and is promptly framed for the murder of Chunilal, who has a dagger stuck in his back. He leaves through a window as the police arrive, knowing that Leela and Shankar will accuse him of the murder. 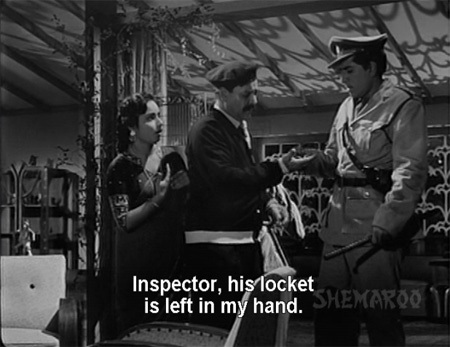 Shankar finds a chain that has fallen off Kishore’s neck and gives it to the police as evidence. What will happen now? Will Kishore be caught and tried for murder? Will Beena be married off to Arun? Will Arun’s deception be discovered by his “parents”? Who is their real son (hmmm…I wonder?)? You’ll have to watch Ek Raaz to find out—but that shouldn’t be any hardship, it’s a most excellent film from Shakti Samanta and company. Kishore is a little old to be playing such a young man, and Jamuna has a double chin (hey, so do I) but they are sweet together and I like how feisty the Beena character is. It’s a treat to see Lalita Pawar as a happy and loving woman, and she is really beautiful when she smiles. 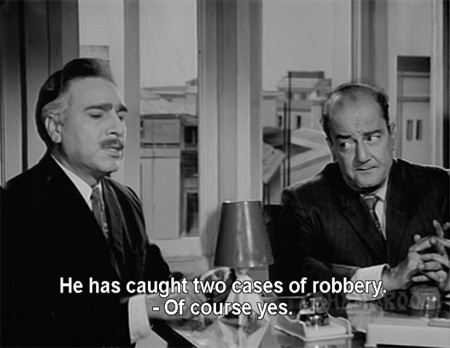 And of course Pran (in company with Madan Puri) does what he does best—makes you want to boo and hiss at the screen whenever he appears, smoke curling around his head. Posted on June 18, 2009 at 9:54 am in Hindi movies	| RSS feed You can skip to the end and leave a reply. Looks adorable! Wish I’d watched it with you. We actually started this one and didn’t get all the way through it (tired? drunk? both? )…I only just sat down with it again and really enjoyed it :-) Definitely rewatch material! I’m excited to see Tun-Tun as Champakali; I always think of her as a “Champakali” because of the movie Rajkumar with Shammi. I wonder what it is about this? Maybe it’s inappropriate for a group watch, cause Carla and I failed to get through it together too :) And don’t get too excited for Tun Tun—she’s only there for about three minutes, although of course they are a hilarious three minutes. seems like such a nice movie..
@Memsaab.. whre do you get these oldies from??Netflix??? I order a lot from nehaflix.com and induna.com (they should be paying me!!!!) :-) Netflix might have it too though. Mine is a Shemaroo DVD. “Oh shucks” is exactly what I would say if I discovered that someone had been murdered and I was being framed for it too. 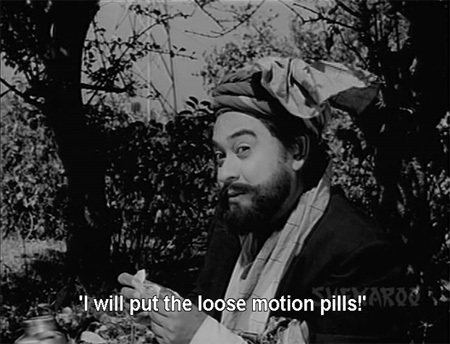 Kishore Kumar looks a lot like Ashok in that picture of him with the “loose motion pills.” I never noticed that strong of a resemblance before. It’s funny you should say that about Ashok, because I noticed it a LOT in this film. Have never thought until I saw this that they looked much alike. memsaab – Jamuna is a famous South Indian actress of 60s- acted in a number of tamil and telugu movies. I personally met her (yrs ago as a teen) at a wedding in our city! How fun :-) She’s cute in this with Kishore! 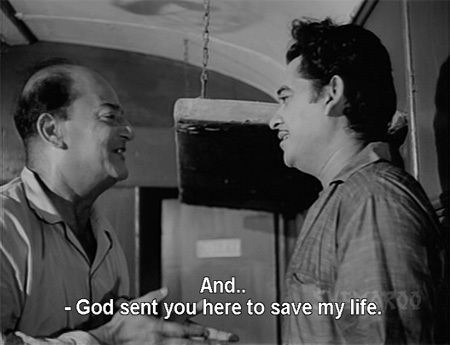 Kishor Kumar is always a must-watch for me. I had a aha moment when I reached the end of the post. A Shakti Samanta film rarely goes wrong, does it, on the entertainment and good plotting? A coincidence: just about an hour ago I was listening to the wonderful Agar sun le toh ek naghma, and thinking I must try to get hold of Ek Raaz. Now I’m convinced! I admire your fortitude, though, in sticking with films with such horrendous subtitles. Even if one overlooks gross understatements like that classic “Oh shucks”, there’s so much here that’s just absolutely just plain awful English. How do these DVD production companies do their subtitles? Don’t they ever get people who’re professional translators? What on earth is a `drudgery burden’? And `anxiety a little-little’? Ugh. Ahh.. what a nail-biter, Lol. But I am glad the movie is well made. I wish I could see it too. 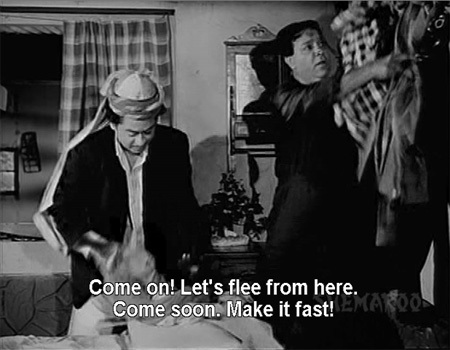 A Kishore Kumar film is always entertaining! A cousin of mine always raved about this movie, though I’d never had a chance to see it. 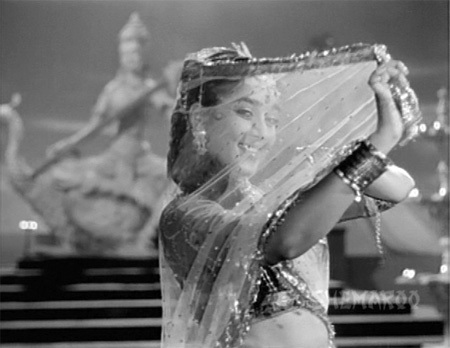 Jamuna does look nice in some frames, doesn’t she? Pran looks dashing and younger than KK here. 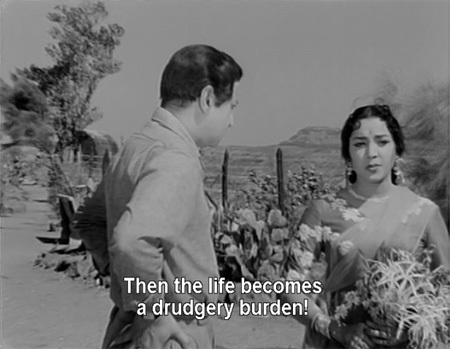 And Lalita Pawar looks such a darling! I just love her! My aunt used to call her Lalita Power! BTW it IS Jeevan Kala again! 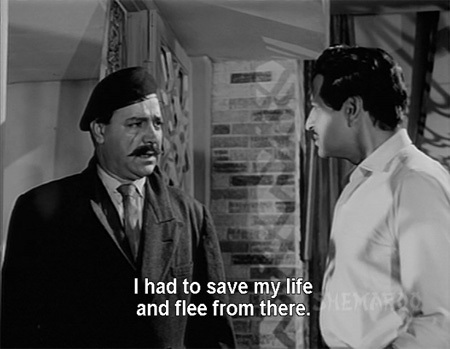 Pran had one of those terrible wigs in this :( but I always love him. And Lalita was positively glowing. She’s another woman who was made to play characters waay too old for her actual age, I think. I love “Lalita POWER”! It’s such a wonderfully genteel way of putting it! :-) “Slow poison” now makes me think of my “Effects of Alcohol” poster (Beware of wine!). I have become a huge fan of yours after reading the blog entry of the ravishing Laxmi Chayya. Ek Raaz, I would love to see mostly due to the wonderful songs like Agar Sun le, Ayee Bhalla starring both KK and Agha. 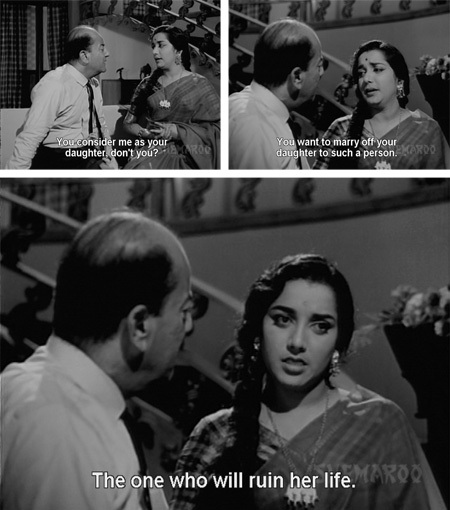 Truly an absolute gem of an entry Memsaab. Thank you so very much from the bottom of my heart. You are welcome and thank YOU Vijay :) Whenever I see Laxmi in a film I am sure to mention it in the review with a screen shot! 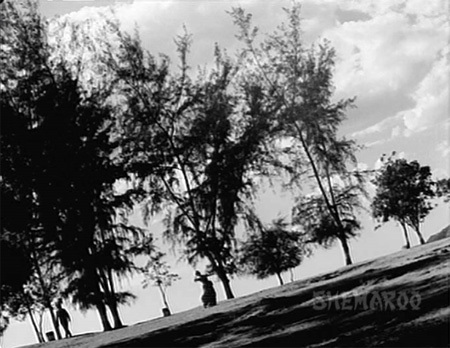 And the songs in this film are lovely, Kishore at his finest! On the subject of mistaken identity movies and Kishore Kumar, let me suggest a movie you need to watch. “Dekh Kabira Roya”. I was maybe 7-8 when I watched it and I vaguely remember Anoop Kumar sitting under a tree and trying to sing. Its Hilaaaaaaaaarious. I am sure u will like this one. Memsaab..where is this film available?..I got to see it..CD, DVD… download, anything? From the watermarks on my screencaps I think it’s fair to say that there’s a Shemaroo dvd out there floating around…probably a vcd too if you don’t need subtitles. This film ( Ek raaz) has clean vanished off the shelves in all formats ..I tried twice, once Shemaroo refunded my online payment ( no stock) and so did myindiashopping. Not available on my usual haunts like webmallindia etc either. PLEASE get this movie uploaded on a hosting site like you did for Rajesh Khanna’s Jaanwar( which I downloaded, thanks), as I love the songs by Kishore in this film and murders and mysteries are just up my alley! In screencaps 6.7.8 nd some more , the actor in the role of Giridharilal is Moni Chatterji nd not Niranjan Sharma as mentioned therein. The magician is Mirza Musharraf. The actor in screencap 6, playing Giridharilal is Moni Chatterji , nd nt Niranjan Sharma as mentioned therein.